Chimp & Zee at uShaka invited me for an unexpected rope adventure (how unusual) and I gladly accepted. I really enjoy trying different things within my very own city, it’s a reminder that there is always something to be explored. I rifled through my contacts to think of a suitable “date” to join me. My client and friend Sabrina sprung to mind. She never backs away from a challenge and her company is always welcome. Off we set on our girls’ day out, Sabrina in the most stylish of sport attire (obviously) topped with her pearly cap added a hint of style to our excursion. How lucky we were with Durban’s summery weather, blue skies, the ocean beyond and a partner in crime that was as excited as I was. It Clears the Mind: From the minute we begun the focus was on the challenge at hand. I don’t often get to press the reset button on my brain and this was the ideal way to take an adventurous break and just enjoy the course ahead. We also left our phones behind as we knew that the team would be capturing our moments (you can request that they take photos). It makes for a digital break which I welcomed with open arms. It’s Heaps of Fun: That is surely obvious by my ridiculously wide smile. I love a challenge and that was why I accepted this particular invitation. It is something that just brings out that bubbly happiness from within, almost childlike in its joy. 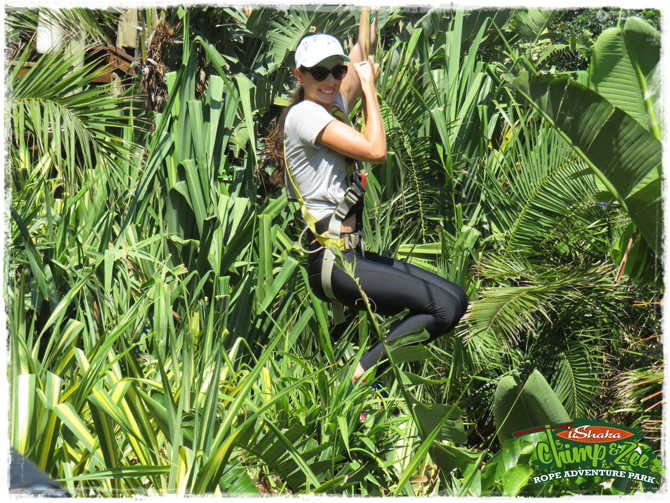 My favourite element was surely the zip lines, it was exhilarating without feeling too frightening. The team members (Thando and Sabelo) were also really helpful and ensured we felt safe and knew how best to tackle the different elements. The View: Both Sabrina and I paused for ages to look over the view of the turtle pool. The shimmering blue was so beautiful it took us by surprise. A Hint of Adrenaline: I wouldn’t say I am an adrenaline junkie, not in the least, but I so enjoy a hint of it. It reminds me of growing up and going to fun fairs and how happy the abundant glow of being outdoors makes me. Chimp and Zee offers just the right amount... exhilarating. It’s a Bonding Experience: Sabrina and I are close in a way that is different to a conventional client relationship, but embarking on this adventure together was a bonding experience both in our shared joy and in trying something new, different and unexpected. Gym gloves if you have them. Not an essential, but it keeps those silky manicured hands intact. A cap and sunglasses if the weather is sunny or if, like me you prefer hiding your peepers behind shades for photos. Water and a snack: There are lockers so you can put your belongings away. A little healthy snack is a welcome reprieve post swinging fun. Your adventuring spirit: We need not leave the city to try something different. It makes you feel alive! I would head back in a heartbeat and it would be awesome for a bigger group of friends to join me. It’s ideal as a team building adventure, whether you’re venturing with your nearest and dearest or looking for some healthy competition with colleagues. I found the course easy, but challenging enough that it was enjoyable and it made me think about how to tackle my next step and keep moving. Perhaps on my next date I will challenge my beloved to this, followed by celebratory cocktails on the Mojo Pier. Clink, clink to fun, folly and channeling my inner adventurer with Chimp & Zee. Read more about Chimp & Zee here, including how to book. As I gear up for a rebrand and take support from creatives around me I realise how often we don’t offer up true, sincere words of encouragement within life, our jobs and anywhere really. I suppose sometimes it stems from fear, the fear of someone being better than us, but the truth is as so many quotes state that the beauty or achievement of someone else does not rule out our very own accomplishments. The other element to consider is shyness and vulnerability. How often are connections missed because we are unable to speak forth what is within our hearts? I have pledged to myself to speak up and offer what is within my heart, yes there is a risk to that always. However, the risk of silence and loss is so much greater and so putting myself on the line for a brief few seconds on minutes is worth it in the bigger scheme of living a well-rounded life (even if some people think I love or care too much, whatever!). I am that type of person who likes to tell random people that their shoes are amazing while I am standing behind them in the bank queue. Once over my shyness I can voice my compliment and people are so often absolutely amazed that a stranger would say something lovely to them. I love telling people how wonderful they are, always sincerely and so if I find that it is false I rather keep quiet. Words spoken in this regard must be true in order to be heartfelt by both parties. In this same vein of thinking I have been mulling over this giveaway for far too long. A giveaway where least of all we think of what we can gain and think about a deserving party. When better to share it than in the month of LOVE – my very favourite emotion. Growing up Valentine’s Day was celebrated as a family and my mother imparted the wisdom of love on us, love for all, not just romantic love on this often commercially driven day. It has stuck with me year in and year out. Giving in the sentiment of love to all... single, divorced, friends, family, colleagues, random acts of kindness. 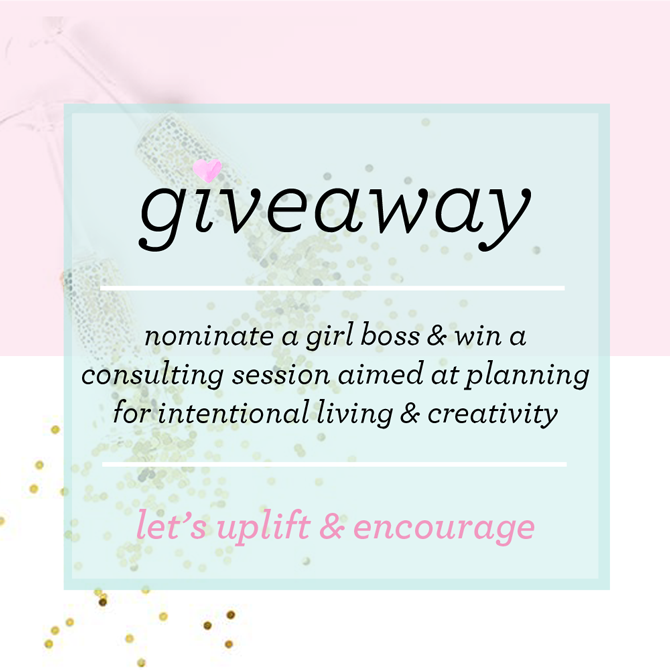 It is with this vision that I share this giveaway with you in order to get us connecting and talking, uplifting and showcasing the beautiful people around us. The giveaway is two one on one 90 minute consulting sessions with me. One for you as the person nominating and uplifting someone and one session for that awesome person. The great thing is the sessions are not only for creatives or business owners they are aimed at living a meaningful and intentional life and so are a great fit for just about anyone looking to solidify their thinking and purpose on this journey we call life. Trust me benefit will be gained if you are open to looking to evolve into living your best life. Nominate a person who you feel needs to know how wonderful they are in your eyes. Whether they have achieved something incredible or are just a fantastic all round outstanding human. Share in your comment a little bit about why you think this is. It truly can be simple or even a declaration of great admiration. Do it your way, speak your opinion. Entries close on the 28th of February 2018 and the giveaway is open to participants worldwide thanks to that handy thing called Skype by which we can run your consult should you win. The winners will be selected first by short listing the most heartfelt nominations and then by random.org. Happy loving and caring. I so look forward to your comments of upliftment and care.